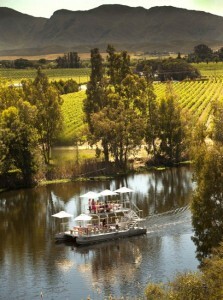 ﻿Cruising down the river on a Sunday afternoon while toasting the good life with a glass or two of wine, is a highlight at the delightful Viljoensdrift wine farm outside of Robertson. The property, owned by the Viljoen brothers, Fred and Manie, borders on the banks of the Breede River where they have their river boat, Uncle Ben! Close by they have their vineyards which are grown on the fertile soil typical of the Robertson Valley which are suitably sheltered from the elements by the Riviersonderend Mountains nearby. Not surprising then that this farm makes an excellent selection of wines which include a Cap Classique, a range of red and white wines and a Cape Vintage Reserve Port. It was in 1998 that Fred (Cellar master) and Manie (Viticulturist) bottled their wines under their own label. Prior to this they were supplying grapes to the local co-op, but eventually they decided it was time for them to benefit from the quality of their grapes and produce their own wines. This required considerable commitment from the brothers but their passion for wine making has paid off as each year the success of their wines grows and grows. Besides the wine operation they have a fruit production operation, with apricots and peaches grown mainly for canning purposes. Cape Blend is a term used for Cape wines that have a significant amount of Pinotage in the make up of the blend. In the Viljoensdrift River Grandeur Cape Blend 2009 the Pinotage portion is 34% with the balance from Shiraz. I first tried this wine with a hearty lamb bredie and found the rich, savoury juices of the food complimented the spiciness of the wine. Tasting the wine before the meal I savoured the spicy, leathery aromas of rich dark fruit, which lead you easily onto the palate with its silky smooth plumy flavours and gorgeous lingering finish!